TwistedBrush Pro Studio like all bitmap (raster) based programs internally store images as a series of pixels in a grid of width x height. This is also how digital photos are stored and any image in a bitmap file format such as JPEG, PNG or GIF. Therefore whenever we talk about sizes of images if we don't talk about the size in pixels we only doing that to make it easier to discuss or to inform other devices such as printers about the intended physical image size. Bitmap Image: Data stored in a grid of width x height pixels with each pixel having a color value. Bitmap images can not be resized without changing the image data. In reducing a bitmap image in size we will be losing data. If increasing the size we will be replicating data. Vector Image: Data stored as a series of shapes and lines with various other parameters. Before the vector image can be seen in any way it must be rendered (also called rasterized) into a bitmap image and sent to the display or printer. Vector images can be rendered into any size bitmap image with generally equal level of quality. Pixels Per Inch (PPI): This is a setting that can be stored in most bitmap file formats that records the density of the pixels desired when the image data is represented on physical media such as paper from a printer. For example a bitmap image of a size of 800 x 600 pixels stored with a PPI of 100 will print 8 inches wide by 6 inches high. That same 800 x 600 with a PPI of 200 will print at 4 inches width by 3 inches high. The bitmap image data is not different regardless of the PPI setting only the size we are telling the printer to print the image - how many pixels to squeeze into each inch of paper. Dots Per Inch (DPI): In the past DPI was often used both when discussing print density and image density however they are not the same and DPI should be used when talking about print density. The difference is that the printer may use multiple ink droplets (dots) to represent each pixel. How you intend to use an image will in most cases dictate the image size you should choose as well as if you should units of pixels or a physical value of inches or millimeters. Print: When your intention is to print an image often it is best to define your image size in the units, inches or millimeters and set the PPI. With that information TwistedBrush Pro Studio will determine the number of pixels needed. 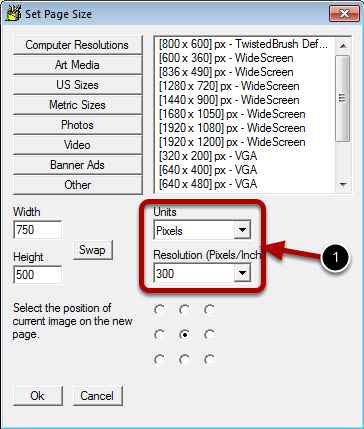 A simple calculation inches wide * PPI = pixels wide and inches high * PPI = pixels high. Typical PPI selections for print are between 100 - 300 PPI. When printing smaller often a higher PPI setting is desired and when printing large for framing on a wall or banners something around 150 - 180 often is good enough. Remember that the higher the PPI the more pixels will be need per inch of print so if you are printing big with a high PPI the image (in pixels) may become too big, consume too much memory and be hard to work with. Web: Typically for web use the images are fairly small since monitors are limited in there size. However, there are times when it make sense to work larger and then resize a copy smaller for publishing on the web. The advantage of this is that the resulting image may look sharper and it may make be easier to work on details when the image is a larger size. Generally it is easier to select sizes in pixels when working on images for the web. Video: In most cases you will have a specific size requirement for a frame of a video and you can match that with your pixel size choice. General Electronic Viewing: Generally the same as for the web however you may want to go larger in this case to give more flexibility for future use. Note: In the Set Page Dialog the PPI selection isn't important if you are setting your image size in pixels. In fact when the unit of measure is set to pixels you can adjust the PPI at any time even after creating your image. The Pixel Per Inch (PPI) setting for you image can be adjusted at any time. However, care must be taken to only change this on a work in progress or completed image only when the Units field in the Set Page Size dialog is set to Pixels. If Units is set to Inches or Millimeters and you change the PPI setting the page size in pixels will need to be adjusted and your image data impacted. When Unis is set to Pixels changing the PPI setting will not result in a change to your page size or image data..